In a good way, that is. A BBC report looked at some sprightly folks who are spending their golden years chasing a farther shore, having downsized or sold their homes altogether and either rented or purchased passage on a cruise ship in favor of visiting ports of call rather than puttering in their gardens. In fact, cruising has tempted some 24 million passengers expected to board ship this year around the world; 10 years ago, the number was just 15 million, according to the Washington, DC-based Cruise Lines International Association. And 12 million of them are 50 or older, with a small portion of that group making the ship either a second or a permanent home. If the idea sounds mad, it isn’t—for those who love cruising. In fact, it can be cheaper than a berth in an assisted living facility. 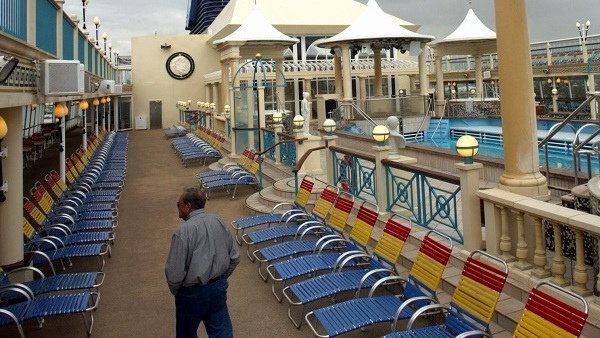 However, A Place for Mom, which helps families find senior care, disagreed in a 2015 blog post, saying that it’s not necessarily true that a cruise ship can provide cheaper living quarters than assisted living facilities. But then, what assisted living facility offers the lure of pampering and adventure? Some of the stats provided by CNBC included the cost of an average reservation on Princess Cruises of $135 per day with long-term and senior discounts, not including medical care or excursions. Compare that with LongtermCare.gov’s figures of about $229 daily for a private room in a nursing home and $3,293 per month for a one-bedroom in an assisted living facility—or HelpGuide.org’s $1,500–$3,500-per-month charge for a place in an independent living or retirement community. Cited in the article was Geraldine Ree, a senior vice president of Expedia Cruise Ship Centers, a travel agency specializing in cruises, who said that about 2 percent of the company’s cruise bookings are for 180 days or more, with the majority of those cruisers being retirees. Then there’s the pamper factor. No cooking, no cleaning, staff to wait on one hand and foot, pools, Jacuzzis, fitness centers, entertainment and those exotic ports of call: what’s not to like? And some companies are actually building cruise ships designed for permanent or long-term residence, such as Crystal Cruises—although their ships are not designed for retirees on a budget. But it’s not a choice for the faint of heart—literally. One drawback of trying to live out one’s retirement on the bounding main is the lack of specialized geriatric or other medical care, should it become necessary. Evacuation in the event of a medical emergency isn’t cheap or easy, and there’s the need for evacuation insurance—also not a bargain item. Still, if you’re prepared to spend your time in close quarters and have the money—and the determination—to make it work, the world could be your oyster in retirement. Literally. This entry was posted in Insurance and tagged health, retirement, senior care. Bookmark the permalink.